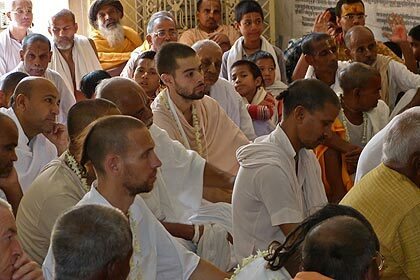 Jaya Sri Sri Guru Gauranga Gandharvva Rasabihari-jiu! 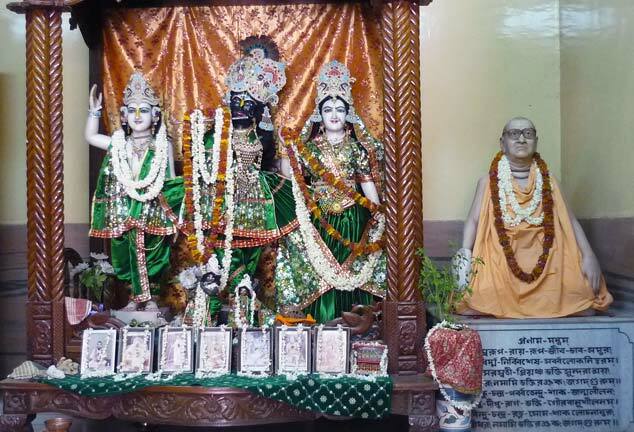 Jaya Jagad-Guru Srila Bhakti Raksak Sridhar Dev-Goswami Maharaj! 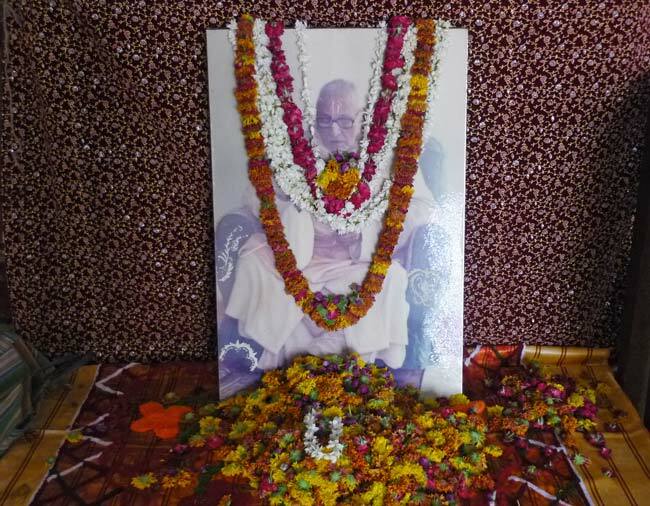 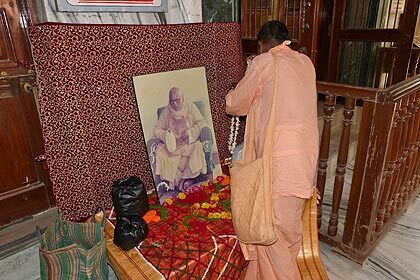 Srila Acharya Maharaj offers a garland and his respects to His Divine Grace. 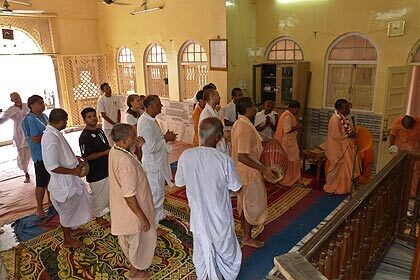 Kirtan in glorification of Sri Sri Guru Gauranga and Vaishnavas. 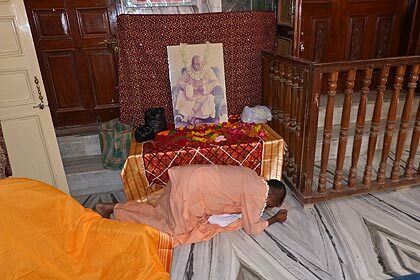 Puspanjali, offering of flowers at the holy lotus feet of Srila Sridhar Maharaj. 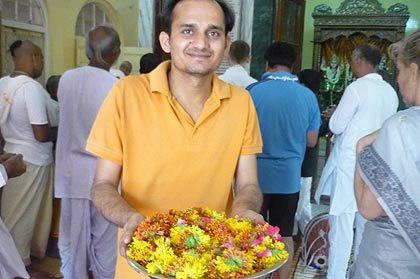 Amit Krishna Prabhu distributes flowers to all. 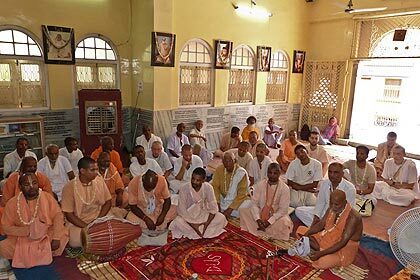 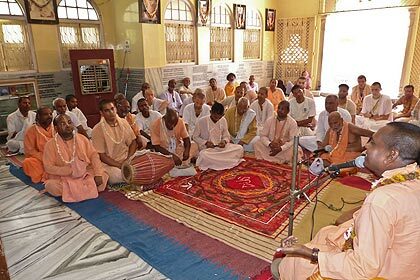 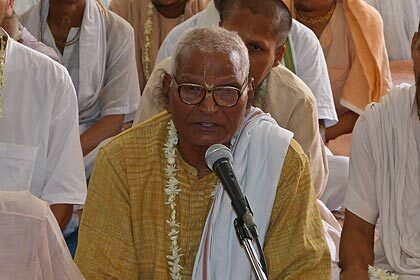 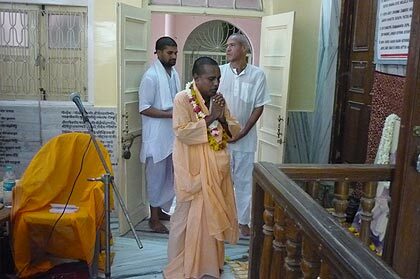 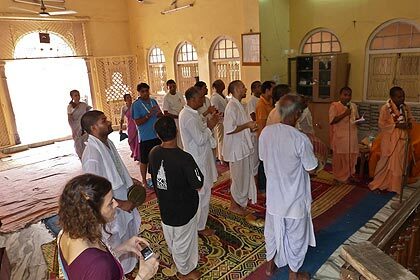 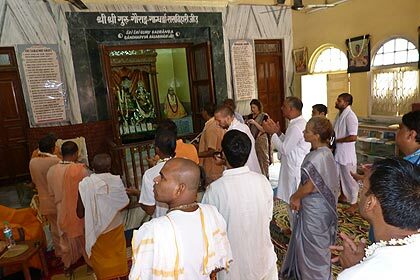 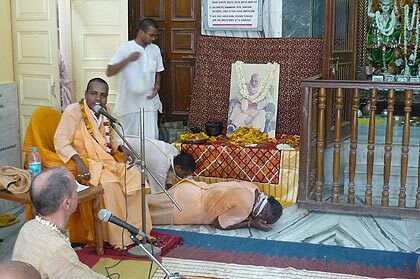 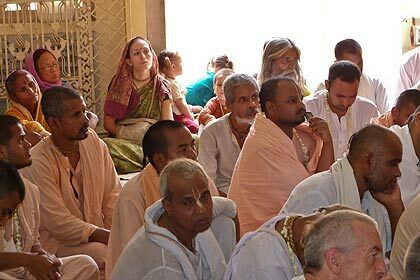 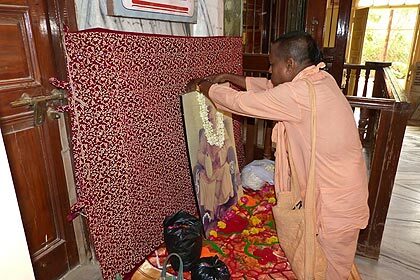 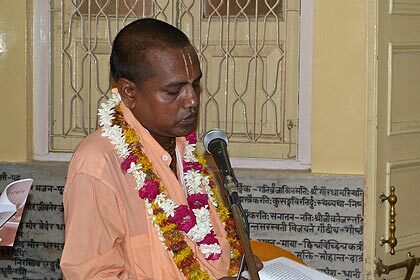 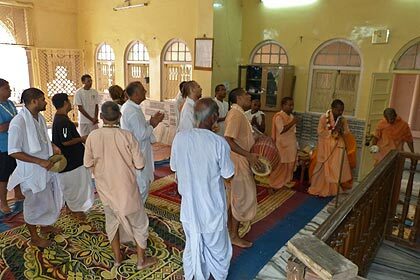 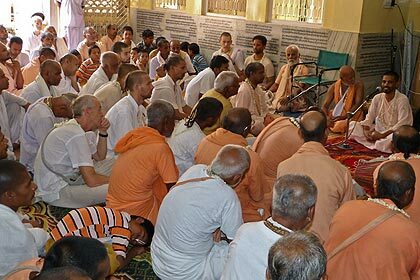 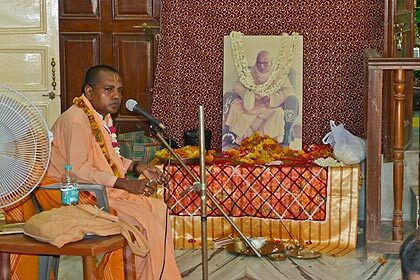 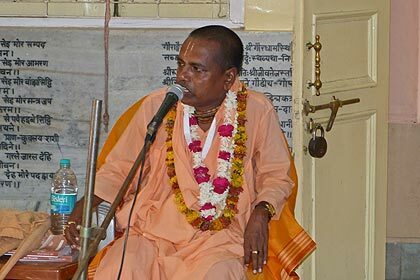 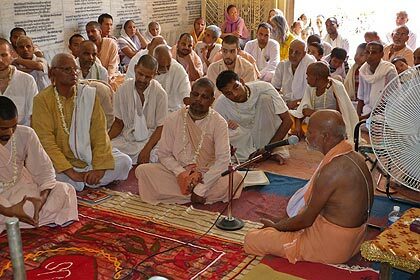 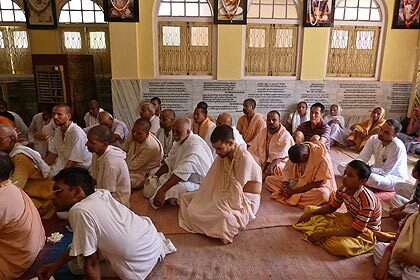 Srila Acharya Maharaj requests Mahananda Prabhu to speak about Srila Guru Maharaj, as he might be the only one in this gathering that had His Divine Grace's association. 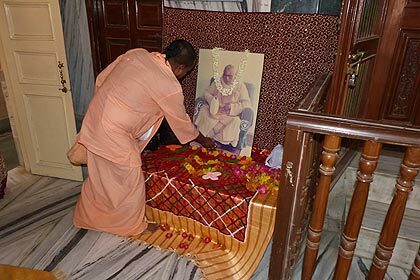 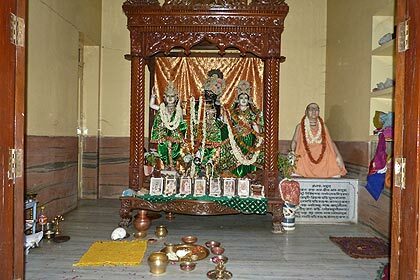 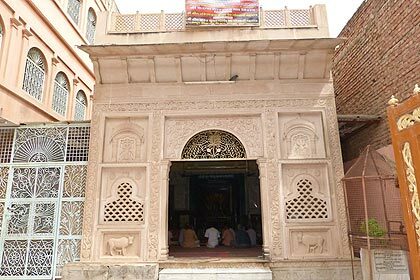 Sripad Mahananda Bhakti Ranjan Prabhu describes some Pastimes and teachings of Srila Guru Maharaj, and highlights His Divine Grace's establishing Sri Chaitanya Saraswat Math as 'The Home of Pure Devotion'. 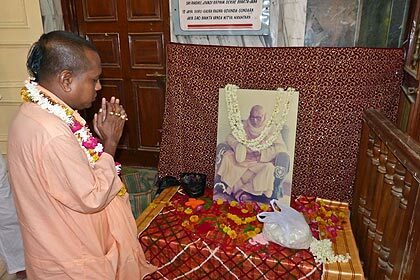 All glories to Om Vishnupad Paramahamsa Sri Srila Bhakti Raksak Sridhar Dev-Goswami Maharaj! 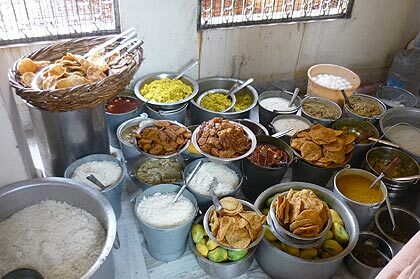 for offering for today's feast. 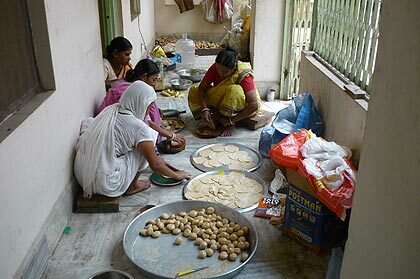 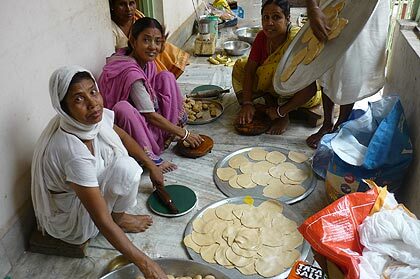 Gita Devi Dasi (left) and other local ladies came to help making preparations. 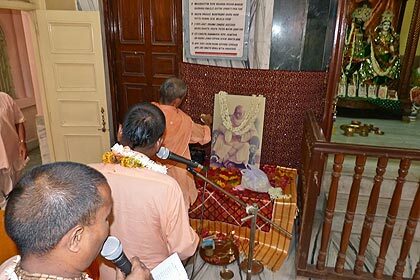 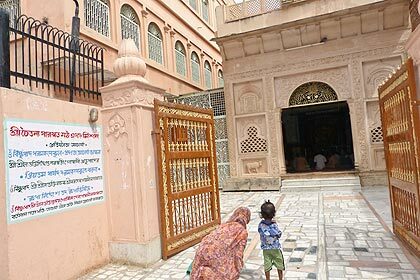 ...and joined in the chanting of Srila Sridhar Maharaj's glories. 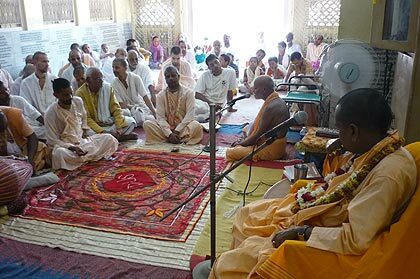 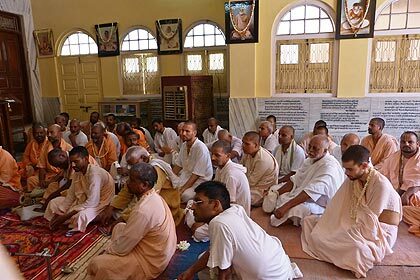 Everyone attentively drank the nectar of Srila Sridhar Maharaj's teachings and Pastimes. 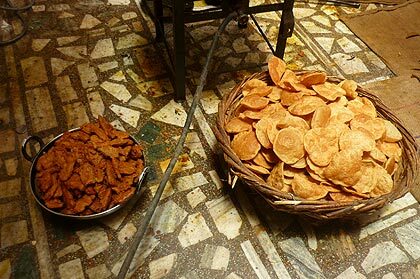 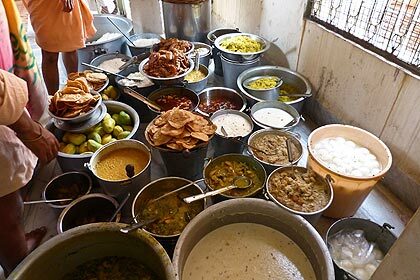 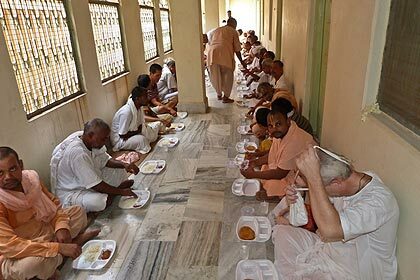 After arati, prasadam is ready to be honoured by all. 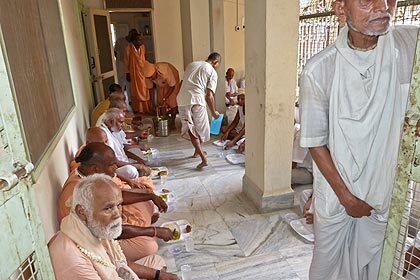 Paneer subji, pakoras, rice, dal, aloo bhaja, puris, sweet rice, rasagulas and a special kind of mango much appreciated by Srila Guru Maharaj were generously distributed to one and all. 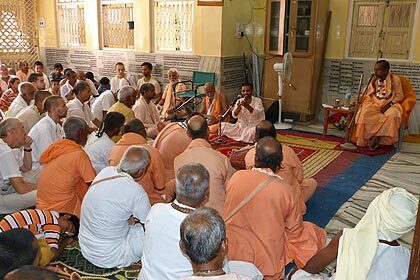 Devotees filled-up two entire floors of our Sri Rupa-Saraswati-Sridhar Seva Kunja. 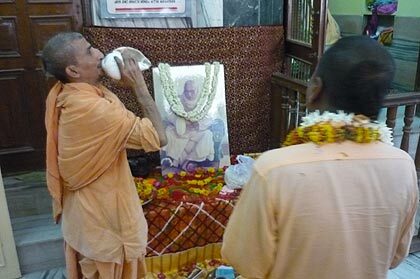 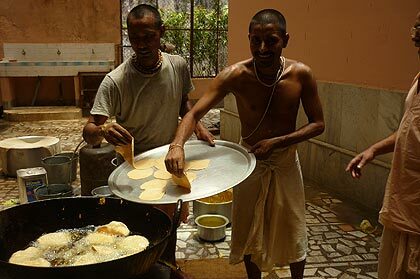 As usual, Srila Acharya Maharaj made sure everyone honoured prasadam to their full satisfaction. 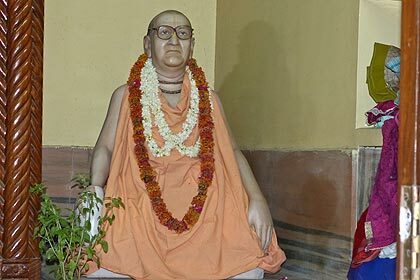 Let us always remember and pray for the causeless mercy of 'The Guardian of Devotion', a king among Vaishnavas, Srila Bhakti Raksak Sridhar Dev-Goswami Maharaj. 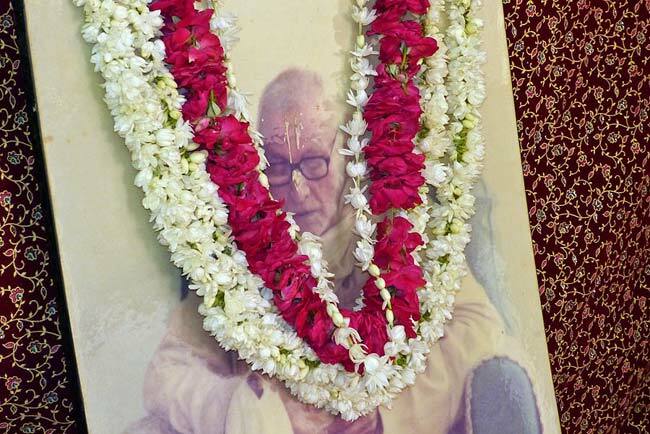 He has left an incomparable wealth by his example, his teachings and his dearmost disciple and successor by whose grace we have come to know more and more of Srila Sridhar Maharaj's glories: His Divine Grace Srila Bhakti Sundar Govinda Dev-Goswami Maharaj.